I have a good habit of discarding a mascara every 3 months. I used to put a date on the tube using a sharpie but now just set a reminder on my phone. While it is a nice hygienic practice, I don't think I could do the same so easily with higher-end ones. Which is why I usually stick with drugstore mascaras. I think L'Oreal makes nice mascaras, and The classic Voluminous waterproof is my all time favorite. I always stock up on them whenever I spot a good sale. This doesn't stop me from trying new ones, of course. Who can resist those new mascara ads with CGI and falsies? 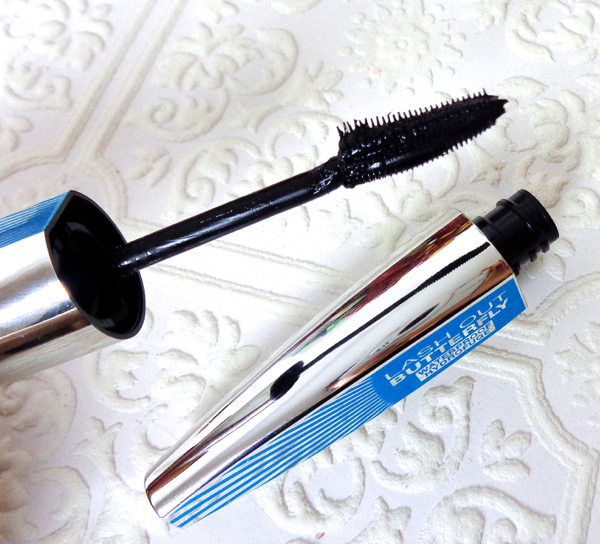 I was super excited when L'Oreal brought out the new Voluminous Butterfly Lash Out Mascara but waited patiently until the waterproof version was available. I had certain expectation I would like this mascara as I have found a few other favorites from the same line like Voluminous False Lash and Power Volume. But honestly? I didn't think it would replace my original Voluminous cause I always come back to this old staple of mine no matter how many new mascaras I've tried. I guess now we are used to this ridiculously fat mascara tubes as they symbolize "big fat lashes". It is shiny and cool looking, but I cannot help but think this is such a waste. It is not like we get more product plus it feels bulky and uncomfortable to hold on to. Everyday it feels like the wand might slip out of my fingers and I would end up discarding it before necessary! 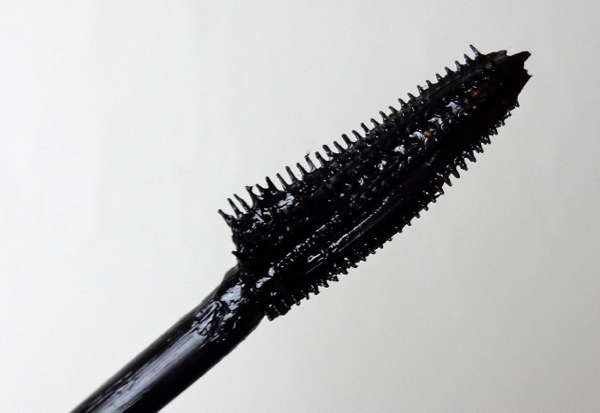 So the key point of this mascara is this rather scary looking asymmetrical brush. It lifts and extends outer corner of the lashes to give that promised fluttery look. The brush reminds me of this, though. Well, anyway, I actually LOVE this mascara, which is quite surprising because I usually am not so crazy about mascaras with "teeth". I initially doubted the equal performance of this lopsided brush on my non-dominant hand side (meaning my left eye). But to think about it, no brush is exactly symmetrical nor are our eyes. This brush does nice job separating, lengthening the lashes as well as volumizing without clumping. And I must say these effects are quite even on both sides. Oh, and it lifts lashes really well as promised, so my eyes look much more awake and flirty (in a good way). Well, I did this "sleepy" eyes to show the lashes a little better to you. Really. I still prefer the original Voluminous mascara since it gives me naturally full and long lashes. 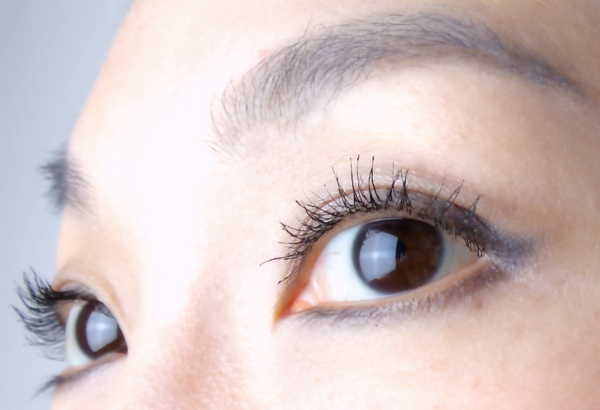 Butterfly mascara gives more dramatic wow effects but it leaves my lashes a bit stiff. In fact, these would be nice staples to rotate for different looks. I do not have any smudging problem, but I rarely do with any mascara as long as it is waterproof. L'Oreal Voluminous Butterfly Waterproof Mascara is an excellent budget choice if you are looking for a mascara with more dramatic effects. Have you tried Butterfly mascara? What is your favorite volumizing/lifting mascara? I have tried this and I am still getting used to the big brush. I like the formula and it does give a pretty lifting effect. My favorite is still Maybelline falsies. I was just checking this one out at target and I went with maybelline rocket mascara, which I am loving right now. I am gonna have to check this one out later. It does look very nice on you. I do love the original voluminous too. I just finished a tube of voluminous false lashes. But I tend to have to wait for the formula to dry a little bit with voluminous mascaras. Woo, I will look forward to your review soon! I can only wear tubing mascara if I don't want any smudges - even waterproof smudges, since the problem is the creams I put on the under eye area, lol. This looks good, though! I liked the L'Oreal mascaras I tried in the past! I have the regular version, and I don't know-I'm not quite sure about this one haha. There's a lot of product on the brush-too much for me. It looks good on you though! Maybe the waterproof is what I should try instead! You have naturally beautiful lashes so I guess you need just a little bit of mascara or even nothing! I haven't tried this mascara, there's so many drugstore mascaras out there that I usually stick to the classics like Voluminous. This looks so pretty on you, I'm going to have to try to stop myself from running out and buying it. I don't need another mascara at the moment. LOL. I guess we're all on the same page here! I've never seen this mascara from L'oreal in our drugstore.. maybe I should give a closer look.. L'oreal has recently launched the new mascara 'magic manga' here in Germany and the responses have been very good! But my lashes are not all that. They do look much different after curling and with help of good mascara, though. I can only wear wp cause regular ones uncurl my lashes right away! I definitely think this works well for you, not the most dramatic but the definition is great. I personally use all my mascaras from at least 4 months to a year. Some mascaras like japanese ones with fiber that are quite wet only become really good after 2-4 months of use although I haven't worn make as often in the last year. Drugstore mascaras are at least $15 USD to $20 USD here so the aren't cheap at all so another reason why I can't throw one out after only a few months! I'm glad you're able to do that and try more mascaras over there! Seriously, they look scary to me. I like the conventional brushes. LOL. Thanks for the review - I've wondered about this mascara. Great tip about setting up a reminder to switch out mascara, too! You're so lucky you actually have lashes that are visible and curl! Very few mascaras work on me. I just figured out today that I have such short and fine lashes that I think all these years I've been overloading mascaras on them when just one light coats do for the most part. Limited by genes! After seeing many reviews on this, it's one of those that isn't for me, I think. None because I prefer mascaras that lengthens. Butterfly does give you amazing lashes though, although I'm sure a part of it is due to good DNA? I had a question- how do you remove your waterproof mascara? I have always had issues with smudging on the lower lash line but since I have blonde eyelashes I must coat them all... but if I go waterproof I haven't found a makeup remover that is sensitive on the eyes and can handle a waterproof formula. What's your method/products for waterproof mascara removal? I understand what you're going through! I wear contacts daily so some wp remover and cleansing oil do burn my eyes. I used to just use cleansing oil all over and it worked well because I don't usually put mascara on my lower lashes that often. I find Shishedo FT Perfect oil and Kose Seikisho relatively mild. Now I am back to using separate eyemakeup remover and my current favorite is from Lumene. It is affordable and works really nicely withouth tugging or pulling. Another tip is to use Q-tips on lower lash lines to clean up the residue. Bothersome, but it ensures to take care of every trace of makeup. The asymmetrical brush is kind of scary haha but it looks like it works well!